From the time I was in my 20’s being active and physically fit has always been an integral part of my life. However, building and maintaining a strong healthy body through consistent cardiovascular exercise and weight-training, along with a healthy diet requires perseverance and commitment, and I had always been able to incorporate all of these requirements on my own. About 6 years ago I began a 3 year graduate program and really needed a stable force in order to help me schedule a workout that was efficient yet powerful. That’s when my husband suggested looking into working out with a personal trainer. It took some time to find a trainer to meet my needs but when I found Woody I knew it was the right fit. He has been my personal trainer for more than 5 years now. He has a wealth of knowledge about the body and the way the muscles work to become strong and efficient. 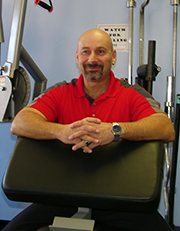 His years of experience training a variety of individuals enable him to provide a personalized fitness program. He is interested in taking the time with the client to discuss ultimate goals and together establish a training and fitness program to meet the needs of the client. Throughout each training session Woody balances weight training and cardio exercise to challenge me to efficiently optimize peak performance. I always leave the session in a sweat and knowing that no matter what areas were targeted I will feel it the next day. Woody. I am no longer in my 20’s, but I’m stronger and in better condition than I have ever been and I have been able to maintain my weight thanks to Woody’s professional expertise in health and fitness as my personal trainer. My husband and I have been training with Woody for about four years now. We started in our late seventies having never had a trainer before. We needed flexibility, muscle tone, and posture training. Woody is very knowledgeable in physical training and is an expert on the muscles in the body. He is encouraging, challenging, motivating and in tune with the needs and abilities of us old folks. He also is fun to work with. My name is Leroy and I am 78 years young, have PARKINSON DISEASE, Diabetes, Blood pressure and Cholesterol issues. After my Physician recommended to exercise every day, I decided to hire a personal trainer. Woody, who is my trainer, helps me a lot, especially when it comes to simple daily activities. This summer I was away in the White Mountains, I was not exercising and had to take 6 SINAMETS for my Parkinson’s disease a day. When I came back Woody was training me again and I was able to reduce my Sinamets to 4 pills a day a day. He helps me a lot and is a very nice guy . I strongly recommend him as a trainer. Hello, my name is Walter and I am 74 years old. I kept in shape pretty much all my life, but at age 65 I took a hiking related fall and injured my right knee and shoulder extensively. According to my physician the X-rays and MRI revealed no broken bones but a lot of soft tissue damage in the shoulder and arthritis in the knee. At age 66 and after a lot of physical therapy my body was still not back to normal and playing golf was not an option anymore. The arthritis in my knee was giving me a lot of trouble to where it was suggested to have the knee replaced. Surgery was not an option for me so I started looking into alternative solutions when a friend recommended Woody. After the initial meeting I was a little skeptic if this was the right thing to do, because I don’t like gyms and it just sounded too good to be true. Today at age 74, after 8 years with Woody as my personal trainer I am as fit and strong as I was before my fall. I hike daily between 4 -7 miles with very little to no pain in my knee but the most important part is being able to play golf with my friends again. The time and money invested into the personal training with Woody, was money well spent. The picture provided with this testimonial is me at 74 years old. I was referred to Woody after having a loud argument with my doctor who “insisted” that I stop most of my activities due to my bad knees. My activities consisted of hiking 8 to 15 miles, cycling, walking Tumamoc, and swimming. He only wanted me to swim. I truly believe in the philosophy that if you don’t use it you lose it. I wanted to play. I have a deep appreciation and respect for Woody. His knowledge and skills a trainer enables him to target my physical weaknesses. By nature, I am a whiner and complainer. He has the patience and ability to motivate beyond my comfort zone. Since I have been with Woody, my balance and coordination, my strength and endurance have improved tremendously. I am able to swim my mile, bike, hike and even run 5K’s! I now have the confidence to continue an active physical lifestyle.